The assassin strikes: An image seared in the minds of a generation. CNN's Jeff Greenfield examines America's optimism in before the assassination. (CNN) -- Like the 1941 attack on Pearl Harbor and the terrorist strikes of September 11, 2001, the assassination of President John F. Kennedy was a defining moment in American and world history. Forty years on from that sunny November day in Dallas, the shooting and the events that followed continue to hold a unique fascination. For millions in America and many more around the world, much of that fascination rests on an enduring feeling that the true story has yet to be told, the case is not closed. Even today, opinion polls suggest a majority of Americans believe the assassination was the result of a conspiracy -- not the act of a lone gunman, Lee Harvey Oswald. "There has never been a single homicide in history that has been investigated to this extent," says journalist Hugh Aynesworth, a national correspondent for the Washington Times. Aynesworth -- who witnessed the assassination, as well as Oswald's arrest and his subsequent shooting by nightclub owner Jack Ruby -- says he has spent much of his career "investigating and knocking down" various conspiracy theories. His book, "JFK: Breaking the News," published next month, recalls how as a young Dallas Morning News reporter "pure dumb luck" put him in the right spot as history unfolded before him. Of the conspiracies, he is blunt: "There is no evidence, pure and simple." Although he says the Warren Commission investigation was rushed and had its faults, Aynesworth has no doubt it got it broadly right. And yet the conspiracy theorists remain as active today as ever. "We all love a mystery," says Aynesworth. But, he says, all the conspiracies lack one crucial element -- fact. 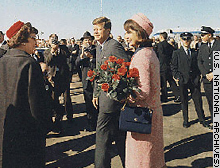 November 22, 1963: The Kennedys arrive at Love Field airport, Dallas. Many of the conspiracies he says are rooted in a distrust of government that emerged in the post-Kennedy years with scandals like Watergate. For Richard Stolley, former LA Bureau chief for Life Magazine, the reason the assassination continues to attract such theories is the almost unbelievable way a young, glamorous leader met his end. "The assassination of a popular and charismatic president, seemed inconceivable to America," he says. It was Stolley, now a senior editorial adviser at CNN's sister company Time Inc, who met amateur cameraman Abraham Zapruder the evening of the assassination and brought his infamous film to public attention. The film, the only color photographic record of the fatal shot, has been examined and re-examined by countless experts and their various interpretations applied to support theories of who fired it and from where. Stolley also has little doubt that the Warren Commission got it right, attributing the killing to the act of a lone gunman. But he says, the commission had its flaws, planting the seeds from which the many conspiracy theories started to grow. The Kennedy family in mourning with JFK junior saluting his father's casket. "The inconceivable nature of JFK's murder is behind the widespread feeling that a conspiracy was responsible," he says. "For many Americans, it is not possible to believe that one disgruntled, emotionally disturbed ex-Marine could have changed history so radically by himself." On a broader level, much of the enduring fascination with the case has to do with the mystique surrounding John and Jackie Kennedy and the mythical land of "Camelot" that was built up around them. Kennedy was America's youngest elected president, married to a glamorous wife and living the post-World War II American dream. In 1962, in the midst of his short-lived presidency, he led America through the potential Armageddon threatened by the Cuban missile crisis. Despite exposes written after his death hinting at drug dependencies, connections with the Mafia and a succession of extramarital affairs, he remains a widely admired president. Many recalled the hopes and dreams they felt Kennedy had made seem possible. "Kennedy had been a symbol of freedom and hope the world over," wrote one U.S. reader. "Kennedy made us dream of a bright collective future," said another writing from Belgium. Then, with the crack of a sniper's rifle, the president was no more and that brief era of Camelot came crashing down. Such was the near universal shock that it was perhaps inevitable that many would try to seek explanations beyond the simple act of a lone man -- optimism turned to cynicism. "The assassination changed the way we thought," says Aynesworth. "We had to come to terms with the realization that one small man could change the course of history with just a couple of shots."